Friends, I made it to Sephora! I loved the layout of the place and got really excited at some of the stuff there. I also came away with a few things and cannot wait for more brands to make their way here. First of all, I must say that the SA's were not too sticky....i.e they did not shadow me around but gave me some space and were near enough for me to call when I needed assistance. One in particular, Eunice who manned the MUFE counter was very professional and spoke very good English. Best of all, she allowed me to help myself to some of the application wands and spoolies on the counter for customers to use while testing products. 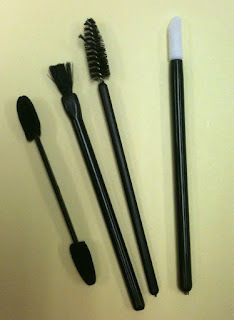 I took a dual tipped sponge applicator, a brush, a spoolie and a lip gloss applicator. These are so useful for when you travel as the size is just right and she had no qualms about me taking one of each.....so sweet! I also spoke with another SA, Isaac and he was great too, explaining everything to me and taking me round the shop to show me all the goodies. There were two more which I could not get the name of, who were just as patient and helpful. 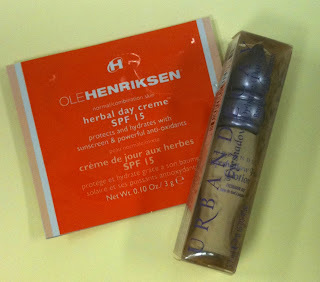 At the chekout, as I was paying for my products, I got two samples - one was Urban Decays Eyeshadow Primer in Eden and a day cream by Ole Henriksen. Have you been to Sephora yet folks? 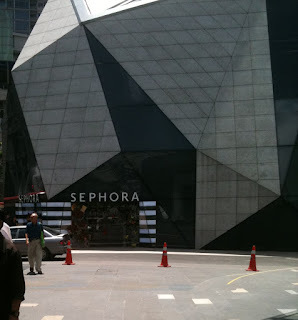 If you do go, feast your eyes on the Sephora brand of goodies and most of the stuff on the right of the shop is stuff that we did not previously get in Malaysia.....hope you see something you like there! Happy shopping. By the way, Sephora OFFICIALLY opened yesterday (4th May 2011). Baking as a little girl just before Christmas every year started me on this journey ......all those years ago I remember watching mum bake. All I did was watch and of course, lick the spoon. When I was really young, it was a wooden spoon that did all the mixing and then came the electric beaters and thank God for them because we then had two beaters to share and lick between the two of us, my sister and I. And the bowl! Oh.....it was just bliss trying to extend my finger until it was long enough to reach ALL of the batter in the bowl. What joy! Which is why I love baking to this day. I have until recently only baked for my family and close friends until recently when I decided to take what I love doing a step higher and now I sell my creations. I am not a professional by any measure and whatever I know, I learnt from trial and error as well as the internet. Enjoy!